Spirit Catcher is the band formed by Jean Vanesse and Thomas Sohet, one of the most successful tandems of producers from Belgium. Their house acts have become one of the most demanded is their style. We will have the second chance to enjoy their groovy performance, since the first one was three years ago in their visit to A Coruña, in the 981 Festival @ Playa Club. They have released tracks in well-meaning record labels Duch as Freerange, Winding Road, Missive or Moodmusic. They have been playing live on Saturday, September 6, in the Superclub, and www.mixside.com had the pleasure to ask a few questions to this couple of great producers. Hi Jean & Thomas, nice to meet you and thanks for your time for this interview. Dj sanroman.com: If we look back at some of your bios on-line we would realize that there’s a lot of myth around you. You can read that, for example, Jean was born in his father’s studio while Thomas was born when a song from Earth, Wind and Fire was sounding in the hospital room… Is this all a legend or it’s a fact that life sometimes goes beyond the imagination? Is music so rooted to your first steps as that seems? Tom: Of course it’s true !!! As written at the beginning, it is the true story. We have some pictures of the day of Jean’s birth where we can see his father preparing a drum take. The little story tells that his mother had her first contractions while they were doing the bass drum’s mic test. About my fascination for flashing lights, it’s also true ! I was totally triggered when I played for the first time on a synth. I saw all the lights of the studio starting to flash, perfectly responding to what I was playing on these black and white keys ! I directly understood that only with this keyboard I could find some excitement. Djsanroman.com: Which one was your first contact with electronic music? From what kind of music did you arrive to this genre? Who are your influences? Tom: Laurent Garnier during the early nineties. He was the first deejay I have seen able to mix two records that became a new one. It was a revelation for me. Djsanroman.com: You have released a lot of tracks in a lot of respected labels, as Moodmusic or Winding Road… Which is the track that you love most, the one that never falls from the playlist? Tom: Huuum! Not easy to answer. I think our most favorites are our remixes for Kirk Degorgio “Starwaves” and for Satoshi Tomiie “Glow”. We’re still both very proud about it. Djsanroman.com: I have the pleasure to see your live act @ Club 11 Amsterdam, two years ago… One of the best club I have ever been that now have been demolished… You have been playing all around the world since 5 years ago… What was your best experience touring? Do you have any favourite place to play? How was your experience at Goa Madrid ? And in your last visit to Playa Club? Tom: Damn, I didn’t knew that club 11 had been destroyed… Bad news !! 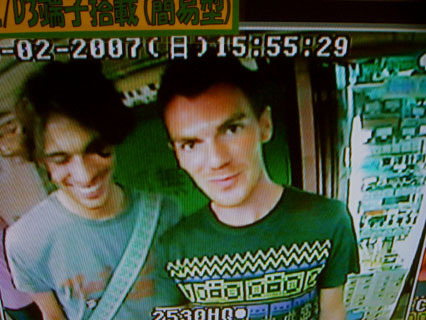 One of our best touring experience is in Japan. It’s all about the power that young people have over there. You feel like transported by their smiley faces and their enthousiasm. Goa Madrid is such a great remember too ! First time in our life we were playing our musc in front of so much people. You can believe that you can’t forget ! !Amazing remembers. Djsanroman.com: You use to play live… have you experience as dj’s? We have two different versions of our set. We have a version where we play both live. We call it full live (of course ;-)) and we’re on stage with lot of gears and play only Spirit Catcher tracks. And we have another version where Jean is deejaying and I add keyboards and FX’s on the tracks. With this version we can be more flexible and react to the people on the dance floor. It’s an interesting experience as it is much improvised. Each set is 100% different from the previous one. Djsanroman.com: When you’re at the studio, producing music, which kind of tools do you prefer: analogic or digital? Basically we use both. We like to mix old analogue gears with new modern technologies it “futurize” the past very well. This is the shortest and closest description we can give for the Spirit Catcher’s sound. Djsanroman.com: You are friends and you work together, how is a normal day in your lifes? Do you go clubbing ? Do you have any non musical, particular hobbies? Tom: Music is all our life !! So a normal day is a day only with music. A day without music is not a day. The only thing which is able to change our focus : Girls !! DjSanroman.com: Food can tell a lot about a person, and also about his music… What’s your favourite menu?